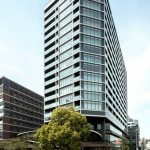 Toshin Development Co., Ltd. of Takashimaya group, one of Japan’s most renowned department stores, and Tokyu Land Corporation have developed an outstanding luxury residential and commercial complex. Situated in the business district of the bustling city of Yokohama, the new Yokohama Kitasaiwai Building provides a peaceful sanctuary for residents, designed by the architects to create a ‘calm environment’. 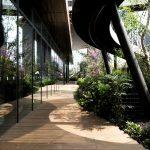 The building exhibits elegant planting and landscaping with Kebony, a natural wood made to last, used for the exterior decking due to its heightened physical properties and natural aesthetic. 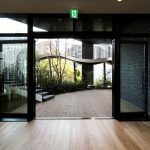 The innovative development of the 17-storey building was led by Toshin Dvelopment Co., Ltd. and design of the common area by Hiroshi Nakamura & NAP. The Takashimaya Rose Hall, a spacious 500 capacity multi-purpose event space spans from the first to the third floors of the development and is widely used as a cultural centre, exhibition hall and corporate offices. The remaining upper floors are home to luxury apartments, in which a calm living environment has been promoted through the use of natural materials like Kebony. Chosen to ensure the exterior decking in the common area would seamlessly merge with the surrounding foliage and greenery, the beautiful and naturally enhanced wood was a key part of the innovative development. The architects were attracted to Kebony due to its durability, dimensional stability and rich brown tone which fades to a natural silver-grey patina over time, as well as the fact that Kebony is a natural product. A resistance to wear was also a vital requirement of the development, which rendered Kebony and its hardwearing qualities the perfect material. The sustainable timber’s role in the development of the Yokohama Kitasaiwai Building is another example of the company’s international growth and ambition, which have been supported by the opening of their new production facility in Belgium in October 2018. Developed in Norway, Kebony’s revolutionary technology is an environmentally friendly process which modifies sustainably sourced softwoods by heating the wood with furfuryl alcohol – an agricultural by-product. By polymerising the wood’s cell wall, the softwoods permanently take on the attributes of tropical hardwood including enhanced physical properties and extended warranty. Although a natural material, the wood requires no maintenance beyond normal cleaning and can stand up to testing conditions far better than untreated softwood.